Whisk yogurt in a bowl till smooth. Pour the 2 cups of water and churn the mixture well. Smash a small piece of ginger and a green chili, add to the buttermilk. Then add 1/4 teaspoon cumin powder, finely chopped curry leaves and cilantro, a pinch asafoetida and salt. Stir well. Serve chilled in the refrigerator or in a mud / clay pot. Hi close friends. I observed this awesome web site from google. I was seeking absolutely a unique expression but bing suggested me this website a couple of occasions. I entered to here and read lots of items here. Neer Mor is a refreshing summer drink made with all the goodness of buttermilk, spices and herbs to beat the summer heat. Amma whisked some buttermilk flavored with all fresh ingredients she had in hand, poured them in the mud/ clay pots. She then served them chilled ~ it is true bliss to have the chilled Neer Mor with all the fresh flavors from the herbs and the mud/ clay pot. 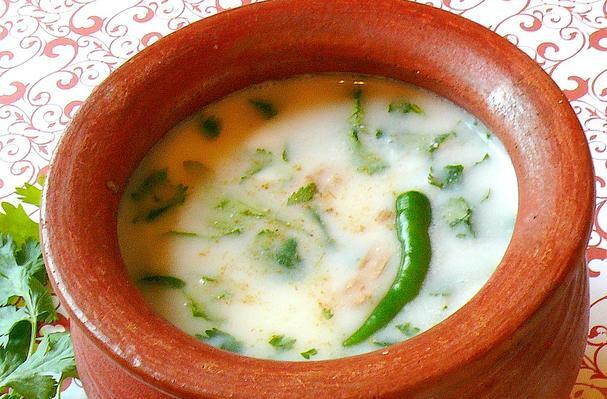 The mercury has been soaring in Seattle and its neighboring cities over the past few days with temperatures already in the 90s... During these hot summer days I make Neer Mor / spiced buttermilk quite often~Amma`s recipe to cool the body.